Limitless, created by Atomixx is a proprietary weight loss formula that is produced in the United States within FDA-compliant manufacturing facilities. 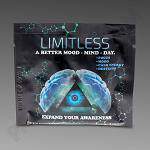 Available in capsules and liquid forms, Limitless provides that extra boost you need to shed those few extra unwanted pounds. Ingredients include: Beta-phenyl-gamma-aminobutyric acid, choline biartrate, ginkgo biloba extract, vitamin B-6, and caffeine.